When villagers brought an abandoned elephant calf to the Centre for Wildlife Rehabilitation and Conservation (CWRC) in Northeast India this October, veterinarians had a tiny mystery on their hands. 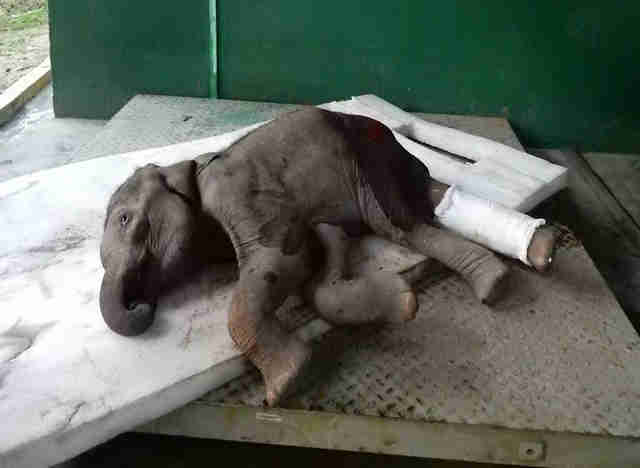 Villagers said the young elephant seemed to have trouble walking and may have been left behind by her herd. After examining the 2-month-old calf, it became clear to staff why. "On external observation the left pelvic area was swollen and studded with lacerations," said Dr. Bishwajit Boruah, who works at the rescue center run by the International Fund for Animal Welfare (IFAW) and the Wildlife Trust of India (WTI). "Also, the left hind carpal joint seemed to bend whenever she moved." IFAW-WTI veterinarians X-rayed the young calf and found no fractures. 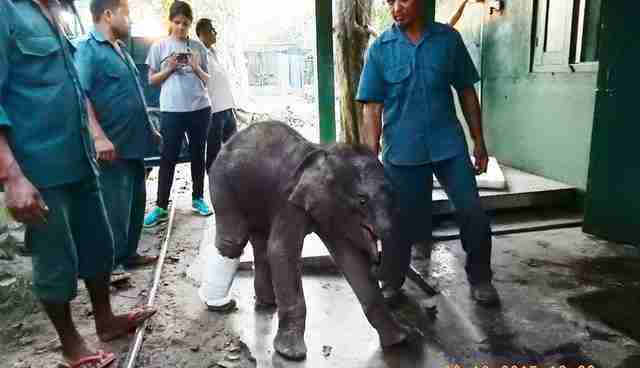 They then decided to splint the elephant's leg and apply a plaster cast to give her extra support while walking. Within days, she was walking around comfortably again and was transferred to the CWRC's animal nursery for observation. Staff say she'll have to wear the cast for at least two months, but even after it's removed, it's not 100 percent certain she'll be able to rejoin her herd. One out of every five elephant reunion attempts is unsuccessful, according to the WTI. Until then, the young elephant will live at the center with 10 other calves being rehabilitated by the IFAW-WTI. Donate to the International Fund for Animal Welfare and help animals just like her around the world.